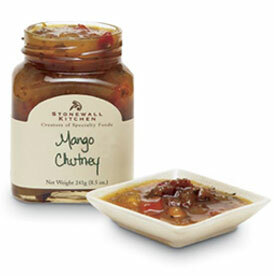 Stonewall Kitchen Mango Chutney: a traditional chutney, the perfect partner for grilled, roasted or sauteed meats. Try this unique award-winning chutney served with your favorite rice or curried dishes. A perfect compliment with Indian cuisine featuring pork or chicken. Stonewall Kitchen Mango Chutney, a pleasing combination of fruits, onions & spices, is a chutney traditionally served with spicy seafood dishes or highly seasoned meats.